Are you in need for travel tickets for your incoming trips? 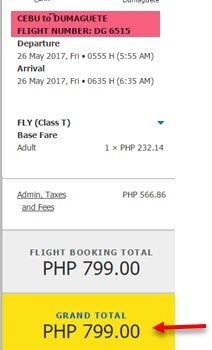 How about checking the new Cebu Pacific promo fares 2017 to select local and international routes? Ongoing promo starting today until April 12, 2017 is the latest Cebu Pacific seat sale 2017. Promo tickets are great for travel on May, June, July, August 2017. For this seat sale, featured Cebu Pacific promo fares are the new routes from Cagayan De Oro and Cebu. 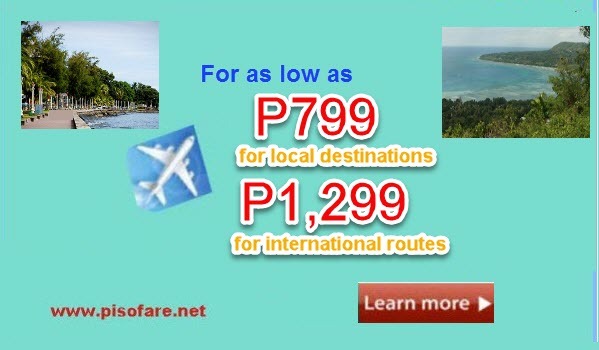 Fly to Bacolod or Tagbilaran for as low as P799 ALL IN Fare. The same promo fare of P799 is also available for trips Cebu to Iloilo, Dumaguete, Calbayog, Ormoc or Roxas. Going on an international trip? Cebu Pacific promo Manila or Cebu to Taipei costs only P1,299. Promo fare to Bangkok, Hanoi, Hongkong cost only P2,599. Fares are good for one-way trip. Inclusions are base fare, Web Admin Fee, taxes and fees and 7 kilos hand carry bag. Cebu Pacific promo fares are limited! First Come, First Serve basis! Book fast! Cebu Pacific promo can be availed by a) buying the cheap tickets at Cebu Pacific Sales Offices, accredited travel agents and booking outlets, b) online booking at www.cebupacificair.com, c) calling the hotline in Manila at (02) 702 0888 or Cebu (032) 230 8888. Would you like to buy your tickets at Sale Offices? Here are List of Ticketing Offices in Metro Manila, Luzon Ticketing Offices, Visayas Ticketing Offices and Ticketing Offices in Mindanao area. Want to check the holidays and long weekends for 2017? Click HERE. You may book the Cebu Pacific sale tickets online and pay thru Payment Centers if you don’t have a credit card. Payment Centers accredited by Cebu Pacific include 7-Eleven, LBC, EC Pay, Bayad Center, Robinsons Department Store, SM Department Store. You may also pay over the counter at BDO, BDO Remit, BPI, Robinsons Bank and Metrobank. The nice summer weather is inviting you to fly to the different destinations in the Philippines to enjoy amazing summer vacation. Book your flights or buy the sale tickets now! Want more airline promos and sale flights? Please LIKE and FOLLOW our Facebook: PISO FARE TICKET to receive notifications and updates promo fares 2017, PISO FARE 2017-2018 and travel tips and updates!! !